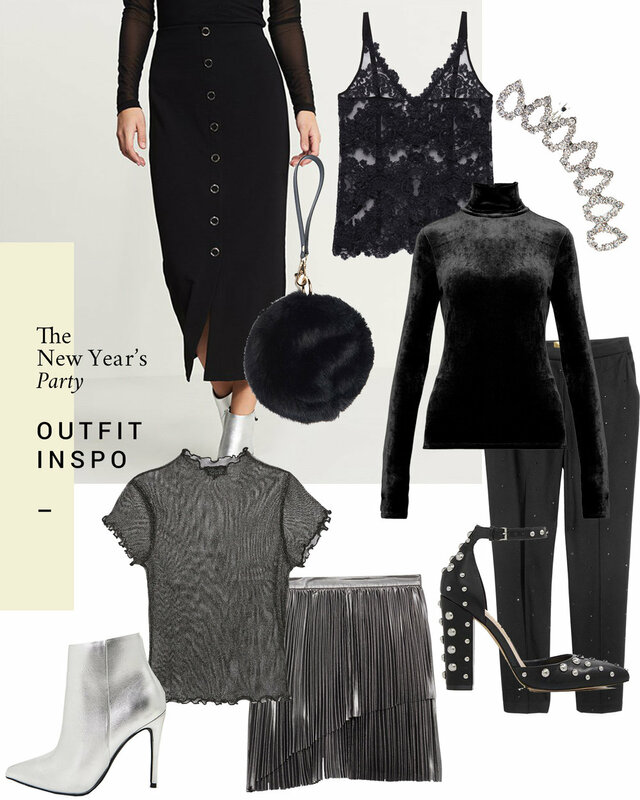 And whether you are dressing for an occasion or staying in to watch the ball drop, I’ve pulled together some of my fave looks you can wear well beyond New Year’s Eve into 2018. If you are toasting champagne at a holiday soiree to ring in the new year, I love the subtle allure of a sheer top. Like this metallic turtleneck from Dynamite or this sheer lace top from Aritzia. With either version, they pair perfectly with a midi skirt for a sophisticated look. Or you can switch things up once the festivities are over with a pair of slim black trousers. Heading to a party at a friend’s apartment? There’s plenty of options to elevate your usual look. The dramatic open back and velvet like texture of this navy sweater dress is sure to turn heads. You can pair it with metallic ankle boots for a cozy but chic look. This slouchy chenille sweater dress from Garage Clothing is another style I’m smitten with. Wear it off the shoulder with some sparkly statement earrings, or layer it with a pair of skinny jeans and studded heels (I’m obsessed with this style from Aldo) for an edgier look. Looking for more outfit inspo? I've linked to some more of my fave pieces below! Happy New Year!